. Archimedes was born sometime around 290 B.C.E. in Syracuse, a Greek colony in the Italian province of Sicily. Although Syracuse remained his home, Archimedes spent a considerable mount of time in Alexandria, Egypt, where he studied and worked with other mathematicians and scientists, including ERATOSTHENES and Conon, two of the eras most well­ known scholars. The stories about his inventions have been embellished, yet they portray the ingenuity of this man. One such story tells how King Heiron II of Syracuse suspected that a man hired to make a gold crown had replaced a portion of the gold with silver. Heiron could not prove his suspicions, so he turned the problem over to Archimedes. While bathing one day, Archimedes noticed both how the water his body displaced flowed over the edge and how much lighter he felt in the water. This led him to the insight that the buoyancy of different materials in water might indicate their different masses. He jumped out of the bath and ran home naked, shouting “Eureka! Eureka!” (I have found it). Thus legend tells us how Archimedes discovered the first law of hydrostatics (Archimedes’ Principle), which states that a body wholly or partially immersed in a fluid is pushed upward by a force equal to the weight of the fluid it displaces. *Scholars cannot date the specific events in Archimedes’ life with accuracy. Archimedes is also credited with having invented a device, known as Archimedes’ screw, that is still used to raise water for irrigation. Archimedes invented the compound pulley and used it to move a fully loaded ship out to sea with one hand. He also developed a mechanical device that demonstrated the movement of the bodies in the solar system. 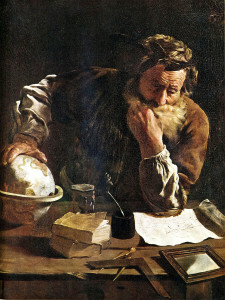 One of Archimedes’ most important mathematical contributions survives today in On the Sphere and Cylinder in which Archimedes explains his discovery of the geometric relationship between a sphere and cylinder. He concludes that the surface area of a sphere equals four times the surface area of its greatest circle and a spheres volume is two ­thirds the volume of the cylinder that inscribes the sphere. Other works that survive include Measurement of the Circle, in which Archimedes resolves the value of pi to between 3 1/7 and 3 10/71. Over the course of many years, Archimedes devised weapons of war for Heiron. In 212 B.C.E., Archimedes’ catapults hurled blocks of stones and logs against Marcellus’ ships during the Roman siege of Syracuse in the Second Punic War. The inventor’s cranes were also used to lift enemy ships and let them fall back into the water again, breaking up on impact. Despite the success of Archimedes’ weapons of war, Syracuse was captured by the Roman army in 212 B.C.E.; he died during that capture. Archimedes’ practical inventions and contributions to mathematics have had a profound impact on mathematics, science, and technological innovation throughout the centuries. Archimedes’ inventions and mechanical innovations have counterparts throughout history and some are still used today. The Romans used the catapult extensively and added innovations of their own. Modern screw pumps of similar design are used in sewage treatment plants and in irrigation systems worldwide, and Archimedes’ pulley systems can be seen in numerous contemporary applications. While largely ignored for the rest of antiquity, Archimedes’ mathematical work resurfaced to have a lasting impact on mathematicians and scientists in later centuries. Arabic mathematicians of the eighth and ninth centuries were the first to uncover his work, and they produced innovations on Archimedes’ ideas in the area of volumes of solids. Many of his works were translated into Latin in 1558 and again in 1615. The Latin texts made ancient mathematical insights accessible to many mathematicians and scientists who, in turn, profoundly influenced the development of mathematics and science in the following centuries. These scholars included JOHANNES KEPLER (15711630), the German astronomer and natural philosopher; GALILEO (1564­1642), the Italian physicist and astronomer; and RENÉ DESCARTES (1596­1650), the French philosopher, scientist, and mathematician. Archimedes’ studies of the areas and volumes of curved solid figures and the area of plane figures led to many discoveries in modern science, such as integral calculus. Archimedes – c. 290­-c. 212 B.C.E. Posted on March 4, 2015 by Natalie. This entry was posted in Inventors, Mathematicians. Bookmark the permalink.